How to unpack that? This tweet was anti-historical and offensive on so many levels. Starting with being upset at the use of the word “Indian,” the term applied to aboriginal peoples by Euro-Canadians historically. But the real kicker is “He worked for a living.” Many of the comments on Gilmore’s article, and a lot of the vituperative, racist tweets I saw complained that aboriginal peoples in Canada survive on handouts from the government and don’t work for a living. No mention of imperialism, the taking of land, the systematic attempts by the Canadian government to steal away aboriginal languages, cultures, religions, and names, of the residential schools designed to also take the children of aboriginals away from them (to say nothing of the horrific sexual abuse therein). Gilmore pointed just how badly aboriginal peoples get screwed in Canada, by comparing them to African-Americans in the United States, in easy table format, which I produce here (and hope that MacLeans doesn’t mind). Look at those statistics and just try not to be offended, saddened, and, if you are Canadian, embarrassed. Hell, even if you’re American, you should be embarrassed by these stats. But, Gilmore’s right. Canadians are a smug lot. My Twitter feed is usually full of all kinds of anti-American comments, the implicit meaning is “Well, the US is a mess, thank god I live in Canada.” Information such as this should end such discussions and puncture our smugness forever. At the same time the furor over Gilmore’s article was raging, another debate was happening over the death of Makayla Sault, an 11-year old from the New Credit First Nation in Ontario. Makayla died of leukaemia. When she was first diagnosed last year, she underwent chemotherapy in Hamilton, ON. But the side-effects were too great. And so she refused further treatment, preferring instead traditional medicine. Obviously, it didn’t work. This raises interesting questions, starting with who has the right to control the lives of children who have cancer. But. Ultimately, we have to respect her decision. Why? Because it was her life. It took me all of about 0.33 seconds to find a Euro-American child who faced this dilemma. Daniel Hauser, a 13-year old boy who was refusing treatment in 2009, for religious reasons. Daniel Hauser, I might add, is white. My Google search turned up other kids faced with this same awful dilemma (the same search also turned up other children in the same position). So, Bombardier is factually wrong. But she is also morally, ethically wrong. 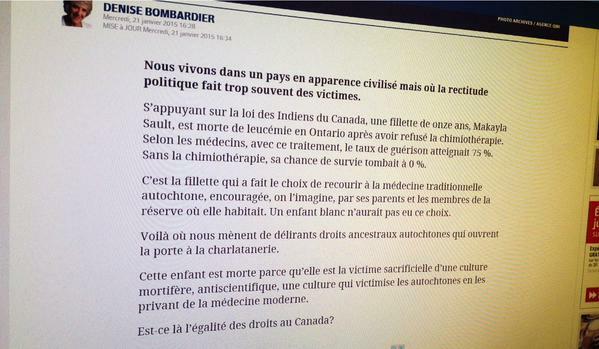 Bombardier’s screed reads like far too many documents I read in the records of Aboriginal Affairs and Northern Development Canada, the government agency (which has had many names) in charge of carrying out the responsibility that the Government of Canada has to aboriginals, according to treaties that both pre- and ante- date Confederation in 1867, as well as Section 35 of the Canadian Constitution. In many of the documents I read during my days working in the field of aboriginal law and litigation in Ottawa, various employees of Aboriginal Affairs, from lowly agents in the field to the directors of the department in Ottawa, referred to the need to civilise the aboriginals, and how white people knew what was right for them. In academia, we call this imperialism. Bombardier says the same thing. She dismisses aboriginal culture as “anti-scientific” and “deadly.” She refers to traditional ways of life as “quackery.” In short, Canada needs to civilise the aboriginals for their own good, just as Aboriginal Affairs agents and employees argued a century ago. And until we do, nothing is going to change. You are currently browsing entries tagged with colonialism at Matthew Barlow.